District officials cut the ribbon on a $14-million recreation center named for one of the greatest singers of his generation who grew up in the Deanwood neighborhood — Motown hitmaker Marvin Gaye. WASHINGTON — District officials cut the ribbon on a $14-million recreation center named for one of the greatest singers of his generation who grew up in the Deanwood neighborhood — Motown hitmaker Marvin Gaye. “He went to Cardozo High School, which is of course one of our great high schools in the District of Columbia. I think it motivated Marvin,” said D.C. Council member Vincent Gray, Ward 7. The two-story 72,000-square-foot facility includes a community room, fitness center, teach-in kitchen, music room and a senior suite overlooking the waters of Watts Branch. Exterior grounds include basketball court, children’s playground, ball fields and a community garden. The modern facility replaces the one-story, brick Watts Branch Recreation Center. Among those celebrating the grand opening was Antwaun Gaye, of Fredericksburg, Virginia, youngest brother of the great soul singer. 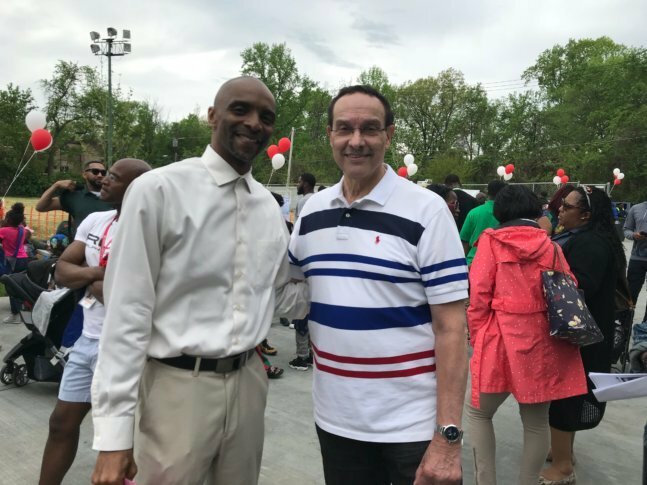 “I’m the baby boy in the family,” Gaye said, “What greater place for this facility than this area in D.C., and I believe wholeheartedly that Marvin would be pleased with this facility. I know the family is,” Gaye said. Neighbors past and present turned out to see the new Marvin Gaye Recreation Center and remember one of the most gifted singers and composers of the Motown era. “I was Marvin Gaye’s paperboy, and I attended school with his sister Zeola,” said Ron Dearing, of Laurel, Maryland. Dearing recalled dropping off the paper at the Gaye home at 60th and Blaine streets Northeast. He also remembers marching off to war in Vietnam and returning to hear Gaye’s song “What’s Going On,” written about Gaye’s brother Frankie returning from Vietnam. “‘What’s Going On’ was an incredible extension of the time,” Dearing said. The building is replete with art. The outside front of the building bears a portrait image of Gaye, and there is art throughout the center. Etchings on glass provide a display of Gaye throughout the years. “I grew up here in Washington, D.C., listening to Marvin Gaye since I was kid, actually creating art work while listening to Marvin Gaye,” said interior glass artist Shaunte Gates, of Southeast. Coming later this year between the outdoor basketball court and playground will be a 6-and-half-foot bronze statue of the great soul singer created by sculptor Vinnie Bagwell. “During the making of this sculpture, I played a lot of Marvin Gaye, a cappella, just so I could hear his voice … you realize how beautiful his voice was,” Bagwell said. The Gaye statue is currently in the foundry being cast.